We champion Washington students for Washington jobs. WSOS has earned bi-partisan support based on the outcomes and progress we’ve made towards our goals. 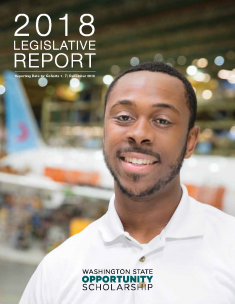 Our annual Legislative Report provides an overview of the demographic, gender, socioeconomic, age and regional characteristics of WSOS Scholar cohorts since the scholarship was first created in 2011. The Washington State Opportunity Scholarship (WSOS) was created in 2011 to address unfilled seats in the high-demand sectors that drive our economy like aerospace, engineering, technology and health care as well as rising tuition costs at Washington colleges and universities. Businesses and the Washington State Legislature joined forces to fulfill the promise of better education and career opportunities for Washington students. Together they have created a unique public-private partnership, with significant support from founding partners Boeing and Microsoft and matching dollars from the State. This first-of-its-kind program supports Washington students from low- and middle-income households to attain bachelor’s degrees in high-demand fields including science, technology, engineering, math (STEM) and health care through scholarships of up to $22,500 as well as professional development, skills-building workshops and genuine industry exposure to help increase the rate at which students enter our state's workforce. We use a proven, objective-driven program with measurable results. Stay connected to hear more about upcoming events and important scholarship milestones. See the organizations and companies that support and power our unique program. Resources for college and promotional partners including our promotional toolkit. Learn more about our mentorship program that matches our Scholars with industry professionals. Discover the impact our program has had on creating a diverse workforce for our state. Interested in learning more about the Opportunity Scholarship? Our staff will be in touch with you soon!